This flight was the basis for the trip. Ben and I both enjoy reviewing new and quirky airline products and when we saw an incredible deal that included flights on the Royal Air Maroc 787, we could not resist. Boarding commenced via bus. Although we were advised to wait for a private business class bus, we hopped on the first bus to depart in order to give us a bit more time to take pictures onboard. 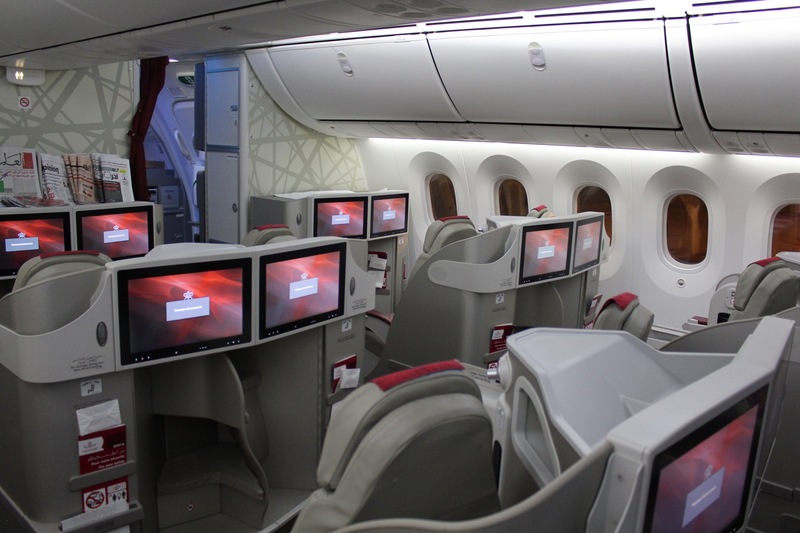 Royal Air Maroc features three rows of 2-2-2 seating in its business class for a total of 18 seats. 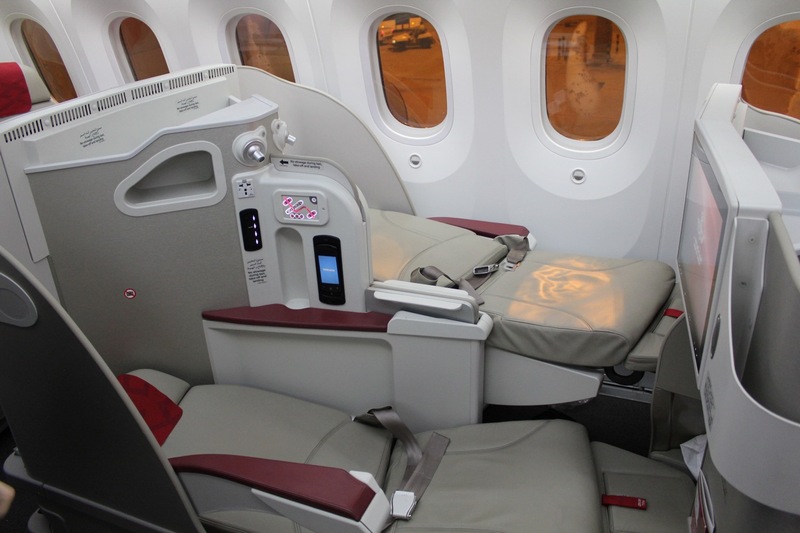 More interestingly, Royal Air Maroc has a very peculiar business class seat. Honestly, it feels like the sort of seat they scored a closeout deal on. While it takes up the same amount of space as a more traditional seat like the B/E Aerospace Diamond seats we had on our Colombo to Doha flight, it is just odd. My window seat ottoman was significantly higher than Ben’s aisle ottoman in the lie-flat position. The seat contained seat adjustment controls, an IFE handheld device, universal outlet, and USB port on my right side. There was also an indentation for a bottle of water. The cabin was kept at nice temperature during the flight, but I noted that individual air nozzles were also available. In the sleeping position, my seat went up and Ben’s seat went down. It was like a dentist’s chair. With a relatively short flight punctuated by two meal services, there wasn’t much time to sleep, but I struggled to get any shut eye, managing only a couple hours. Poor bedding more fit for economy class did not help–the blanket was scratchy and light. In fact, I was cold when I woke up from my nap. The cabin filled up prior to departure. Though originally booked only 07/18, it appeared that many friends and families were upgraded on a complimentary basis once onboard. I’ll be honest. I was expecting an all-male crew who would be surly and distant. Why? I’m not sure really, but I could not have been more wrong. We had an incredible FA in business class who was friendly, gracious, witty, and took amazing care of us. We did not catch her name, but I’ll post this blurry picture of her below (she encouraged us to take pictures of everything). If anyone at Royal Air Maroc sees this, she was one of the best FAs I’ve ever had. One reason I love reverse-herringbone seating is because I cannot see my neighbor’s IFE screen. Nothing is more distracting than trying to focus on your screen with your neighbor’s screen playing something different. This is problematic on Royal Air Maroc so Ben and I decided to watch the same movie and press play at precisely the same time. That movie was Barbershop: The Next Cut which actually was quite heartwarming. There was not a great selection of movies and TV shows — about 25 movies in total. But the movie kept us entertained during the prolonged dinner service. Prior to takeoff, we were offered apple juice, orange juice, tomato juice or water. Moments later, the FA returned with a bottle of Rosé champagne and offered us a glass. It was delicious. The flight left 1:15a and arrived at 6:55a, so I wasn’t sure what to expect in terms of meal service. We predicted there would be a snack after takeoff and a full breakfast prior to landing. Boy were we wrong! No menus were distributed, but a full dinner service commenced after takeoff and took over 2hrs to finish. That’s a bit long for a relatively short overnight flight, but the food did not disappoint. First up came drinks and canapés. One canapé contained beef, the other pineapple, and the third a crab spread. All three were tasty. Next came two salads–the first contained cherry tomatoes, parmesan cheese, and two prawns. The second salad contained more leafy lettuce, chicken, cherry tomatoes, feta cheese, and carrots. A bit odd that the appetizer salad was served with a side salad, but both salads were enjoyable. Main courses were served via trolley, giving us a chance to check out all three choices. I ordered herb-crusted salmon with asparagus and cooked spinach which was exceptional. Ben ordered steak served with potatoes, mushrooms, and mixed vegetables. Next up came a beautiful cheese course, though I was so stuffed by this point I could barely manage a few bites. Funny how your appetite works, though. When the FA arrived again with the dessert trolley, I had no trouble downing cheesecake. Fresh whole fruit was also available. You’d think that would be more than enough food for a 7hr flight, but 75 minutes before landing the lights were turned up for breakfast. No choice for breakfast, but another very hearty meal was presented. It included scrambled eggs with hash browns, bread (which thankfully was not heated or else I would have eaten it), fresh fruit and yogurt. Orange juice was not fresh squeezed, but the coffee was decent. Prior to takeoff we were presented with amenity kits, a nice red washbag with Royal Air Maroc branding. The kit contained a “refresher mist”, hand creme, lip balm, socks, comb, shoe horn, eye shade, toothbrush, toothpaste, and earplugs. The lavatory was standard for a Boeing 787 and contained cloth towels, so thumbs up! 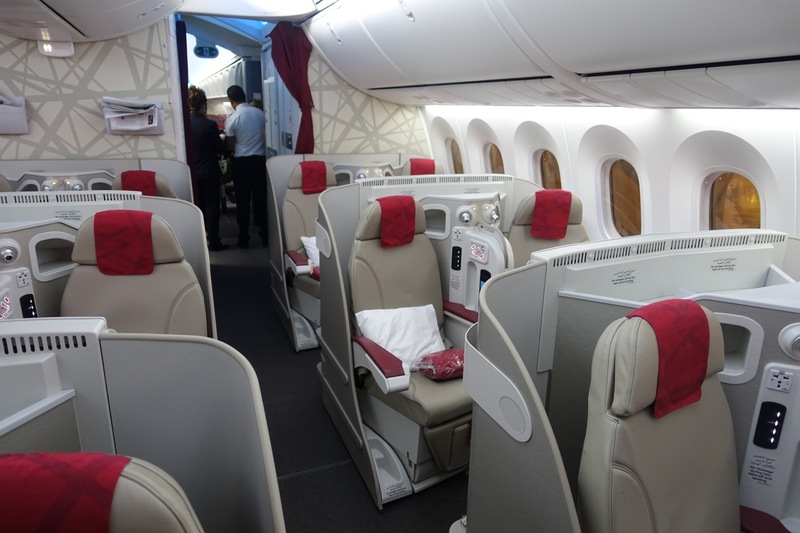 Although the business class seats are a bit odd on Royal Air Maroc, I give the flight high marks. Service was tremendous and the food was excellent. Improvements? I’d like to see better bedding and a more efficient meal service on an overnight flight. Still, I recommend Royal Air Maroc as a safe bet for a comfortable flight. Next Article Thuggish Former United Gate Agent Suing the Man He Assaulted! Did they offer distilled spirits and wine? If so, what were they? Thx. Do you think the aisle seats were so much lower to make it easier for the passenger by the window to exit the seat when the aisle passenger is sleeping? Could be, but it still requires a lot of acrobatics.